All Vise Heads are compatible with the 300 Standard Base, the 305 Low Profile Base, and the 380 Vacuum Base. A new or additional head will add extra productivity to your existing PanaVise, or start here to build your own work holding solution! All stems are 5/8" (15.9mm) in diameter. Our most popular Vise Head for arts and crafts, model making, electronics and other small projects! We've adapted a PV Jr. Head to fit all 300 series Bases. Now you can add all the popular features of a PV.Jr. to a larger 300 series Base. Perfect for hobbies, electronics and small home repairs! 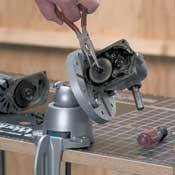 Select the 300, 305 or 380 Base and create your own versatile vise. Our Circuit Board Holders help you work quicker and smarter! Exceptional choice for woodworkers and pattern makers! Work can be attached easily to this universal Fixturing Head. 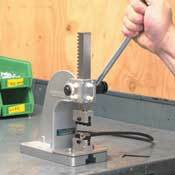 Hold larger objects with this general purpose Vise Head! Jaw pads gently, yet firmly, hold a wide variety of objects including circuit boards, coils and tuners. Jaws open a generous 6". By centering weight, this Vise Heads holds even larger and heavier objects with ease. Jaws open a full 9". Hold a micrometer or small item exactly where YOU want it! This Head gently, yet firmly, holds micrometers of all sizes, in addition to small circuit boards and other items.